Used to hardwood forests, pine trees, pine cones, evergreens, and non-deciduous plants still seem miraculous, more so in snowy areas. In California, plants for the most part retain their leaves throughout the year but become a dusky color. We also have pine trees, native and imported. Seldom do we find pine cones that are as grand as this one, nearly a foot long, and not chomped up as a tasty treat by the local squirrel gourmands. 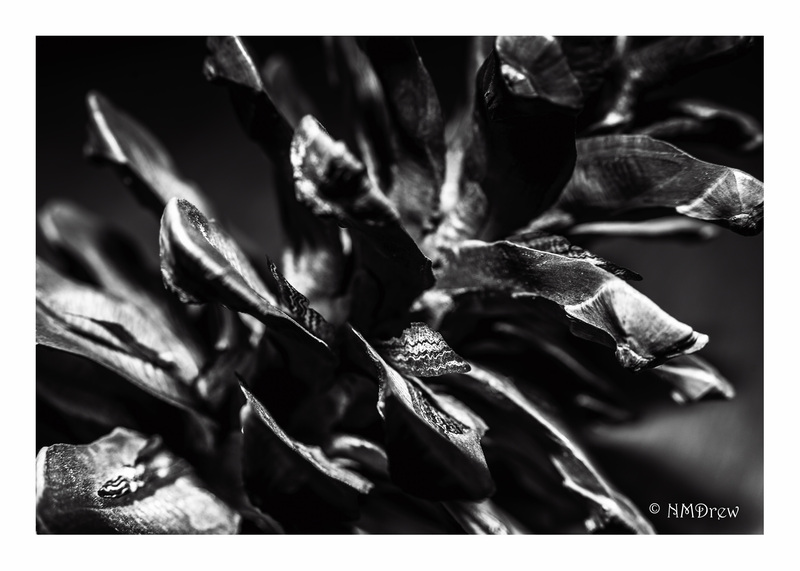 This entry was posted in Glimpses and tagged B&N, black and white, BW, Nikon 24-85mm f2.8-f, Nikon Df, photography, pine cone. Bookmark the permalink. Wow a foot long! Ours are about 3 inches 🙂 I have several strung up in the garden, they close up in cold weather and open up in warm. It’s a beautiful study of one. Pine cones are amazing things . . . one year, my sister harvested the pine nuts from the pinon trees on her property, and sent me a boatful!